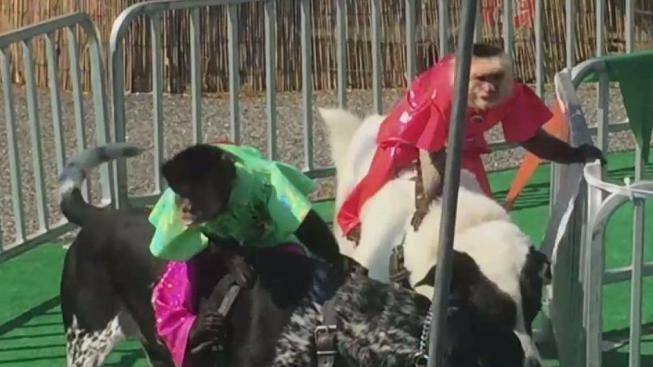 A popular event at a Long Island fair that features races between monkeys dressed as horse jockeys and tethered to dogs with Velcro is drawing sharp criticism from animal welfare experts who call the event "cruel and abusive" and dangerous to the animals. Pei-Sze Cheng reports. A popular event at a Long Island fair that features races between monkeys dressed as horse jockeys and tethered to dogs with Velcro is drawing sharp criticism from animal welfare experts who call the event "cruel and abusive" and dangerous to the animals. In a letter to organizers of Suffolk County's Brookhaven Fair, the North American Primate Sanctuary Alliance (NAPSA), a consortium of groups that care for retired monkeys, asked that the Banana Derby -– a traveling show -– be canceled. The letter argues "the entire lifetime of a primate is negatively affected when they are exploited for entertainment." "Many people don’t know the natural behaviors of monkeys and they may think the monkey is having fun," said Erika Fleury, NAPSA program director. "But when people really learn how harmful this is to monkeys, it’s very distressing." The Banana Derby is just one target of NAPSA and the Humane Society of the United States (HSUS). The groups are also going after so-called "cowboy monkey" acts that include monkeys on dogs herding sheep, a popular attraction at fairs and some minor league baseball games. "Every primate expert says this is cruel and abusive," said Joyce Friedman, HSUS wildlife protection campaign specialist. "This is not the environment for a wild animal." Animal advocates cite risk of physical injury to the monkeys from an accidental collision or neck injuries from repeated, sudden acceleration by the dogs. Mental trauma is also a concern. 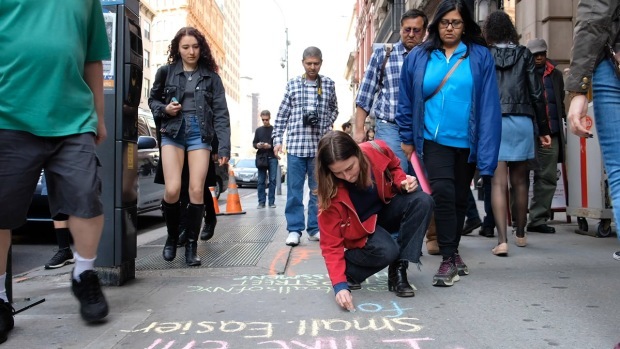 "That could include depression, self-harm, self-mutilation, inability to socialize with others, extreme aggression, apathy," said Fleury. "They’re capuchin monkeys and they’re used because they are very intelligent, inquisitive beings. They’re fascinating, they’re adorable. But they suffer in captivity." Philip Dolci, ringmaster of the Banana Derby, is licensed by the U.S. Department of Agriculture as an animal exhibitor. He scoffs at the criticism. "I’ve been taking care of the monkeys for the past 13 years and never had a problem," he told NBC 4 New York. Dolci said he cares for the monkeys like members of his family –- and that they enjoy performing. "The monkeys love it," he said. "Some people are fundamentally opposed to animals as entertainment and will never be happy until it’s ruined." Dolci is no stranger to the controversy. In 2015, officials in Lake County, Illinois, tried to ban the Banana Derby from a county fair. While the move failed, it was a harbinger of changing attitudes about using exotic animals as entertainment. "Large segments of the public are realizing this is unacceptable for our mere amusement and entertainment. It’s archaic," said Friedman, citing the closure of the Ringling Brothers circus as an example –- and more 130 local laws that have been passed to restrict exotic animals in performances. In the tri-state area, Bergen, Hudson and Passaic counties have recently banned such shows on county-owned land. "Surprisingly we got no pushback," said Passaic County Freeholder Theodore Best, who was a driving force in implementing the ban in his county. "Actually, it was the opposite. We got a lot of people commending us." The Brookhaven Fair declined comment on the Banana Derby and controversy.